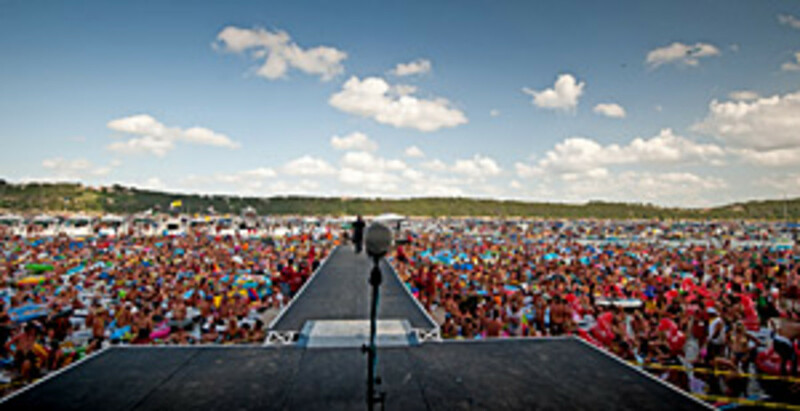 Sea Ray Boats and dealer Sail & Ski Center said an estimated 7,000 boats and 65,000 to 70,000 people attended Brad Paisley&apos;s concert last Saturday at the AquaPalooza 2010 Signature Event on Lake Travis near Austin, Texas. The event, held at The Reserve on Lake Travis, broke all previous signature-event attendance records, Sea Ray said. This year&apos;s attendance numbers are a compilation of on-site estimates by state and local officials, online registrations, and aerial comparisons and calculations. This year&apos;s results are nearly double last year&apos;s event. "We are extremely complimentary of the event organizers. From a public safety perspective, the event was very successful," said Roger Wade, public information officer from the Travis County Sheriff&apos;s Office, in a statement. "We plan for the worst and hope for the best. This event turned out to be the best, with very few on-water incidences, especially for an event of this magnitude." "Aside from the attendance records, we are most pleased that the boating lifestyle continues to be enjoyed safely in an event as large as AquaPalooza," said Rob Noyes, vice president of marketing for Sea Ray, in a statement. "This year&apos;s event was larger and more complex in every facet. It included multiday activities around Lake Travis and in the Austin area. We had a more significant land presence for our vendors and attendees and we had incredible cooperation with our music talent, especially Brad Paisley and his team." In addition to the signature event on Lake Travis, this year&apos;s AquaPalooza will consist of more than 100 events held around the world during the remaining weekends of July. "Our dealers do an outstanding job of coordinating AquaPalooza events in their local areas," said Noyes. "They have made it their goal to unite all boaters, not just Sea Ray owners, to celebrate the unmatched excitement and fun of life on the water."